Fabric Mart Fabricistas: Made by a Fabricista: More Summer Fun in Seersucker! Made by a Fabricista: More Summer Fun in Seersucker! 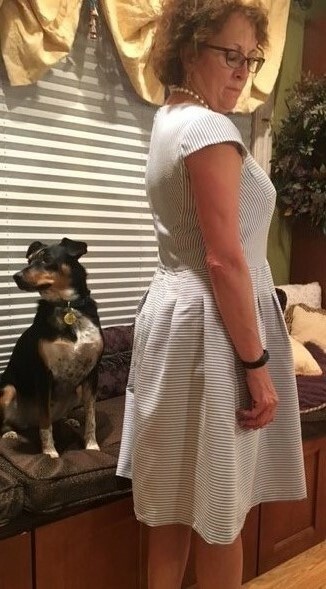 The minute I saw this pattern from Anne Klein for Vogue 1499, I knew I had to make it! I love the lines, I love it in a stripe, and I really think it is a classic style calling for a classic fabric. Nothing screams summer like seersucker! You can play with how you lay out this pattern based on how you want the stripes to run. 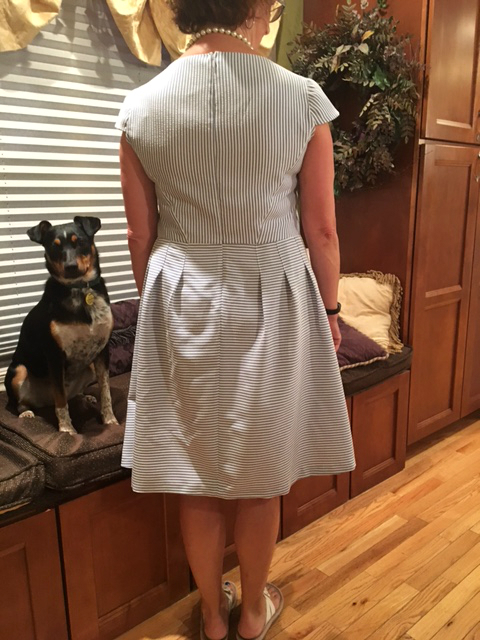 I choose to vary my slightly from the pattern suggestion by making the back center bodice stripe run up and down, rather than side-to-side. I choose to use this beautiful Maggy London seersucker fabric for my dress. This photo was copied directly from Fabric Mart's site. It is 100% poly and is 63"' wide. It so and pressed very well. You can see it HERE. We had to take the photos indoors as it was pouring outside. My dog, Lucy, loves to help when it comes to sewing photos. I really didn't deviate from the pattern too much. A few times I sewed on the machine rather than hand stitching. Some days I love to hand sew and others, well, I will think to find a work-around! This dress is super comfortable in this fabric. It is also lined, and that fabric was also purchased a while ago from Fabric Mart. I love the cute little sleeves. 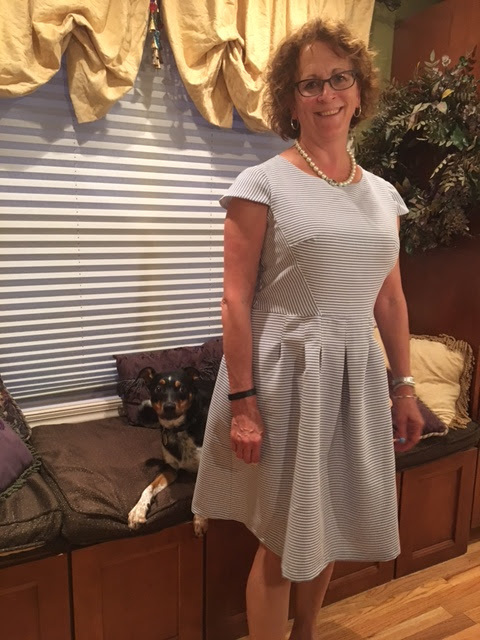 Did I mention I am very happy with the fit of this dress? Thanks for reading and I do hope that you are making some great garments for this hot and very humid summer we are having. If you live in another part of the world, I hope you are looking forward to summer and planning your warm-weather wardrobe! Super dress, I love the stripes and think it looks great in that fabric. Very beautiful Sue! You and Dina have convinced me to buy this pattern!